“What do you do with children, all the time? In Washington, she’d had charge of the kids on weekends; preschools and the nanny had borne the brunt of the day-to-day child-care responsibilities. She’d wanted more time with the kids, then. But now? Now it was every day after school, every evening, every night, every morning, and all weekend long. How was anyone supposed to amuse them, without spending her life lying on the floor, playing with Lego? Without the kids killing each other, or making an unbearable mess, or driving her crazy? I always wanted to be a stay-at-home mom (or a work-from-home mom, at least). I adore kids and wanted to spend as much time with my own when the time came as possible. So, after Big was born, and it was time to return to work, I did just that. It wasn’t easy saying goodbye, trusting someone else to watch over him, and hoping that what I could give him in the hours in between was enough. As I built my family, I started asking for demotions instead of promotions, and I was lucky enough to work for people who respected not only my abilities, but my quest to maintain a balanced life. Then, a couple years ago, things changed. As my company went through yet another round of layoffs, my 8 years of holding my breath came to an end. It was my time. This is the moment I’d been waiting for. It was my chance to define my future, to live the life I’d always dreamed of. I would get the opportunity to be at home with the kids, while doing freelance writing here and there to make some extra income. Yes, my time had come. It’s been two years this week. Two years. And here’s my secret. I’m not as good at it as I thought I’d be. And that was my biggest fear. Goodness knows I try. I want to be the mom who patiently sits and plays Star Wars guys for hours. I want to be the mom who comes up with creative projects that have us wasting the day away (but building brilliant minds at the same time, of course). I want to be the mom who has impeccably dressed kids who shake hands with grown ups as they politely say hello. I want to be the mom who sits and talks about my expectations and hopes for behavior rather than running through the house yelling at the sound of yet another scream. I want to be the mom who volunteers for the PTA, makes homemade kale chips, and writes the great American novel in my spare time. I’m none of these things, it seems. So I find myself clinging to the thing people told me I was good at for years. Writing, making a connection with people. So I blog, I share, and I hope that I’ll get a bit more positive feedback. That someone will confirm that this is what I was meant to do. Because, honestly, at times I feel lost. I’m trying to reconcile who I was with who I wanted to be with who I am. And as I write, I try to remind myself that I didn’t used to feel this at ease at a keyboard. I saw other writers who made it look so easy while I banged my head against a wall. It took time. And practice. One day there was a shift. What was a job became a passion. Two years of being at home with three kids. That’s nothing, right? I’m giving it time. I’m practicing. I’m trying to learn from the people around me who seem to do it so naturally. And I hope that one day, not too long from now, I’ll suddenly realize I’m the mom I thought I would be. 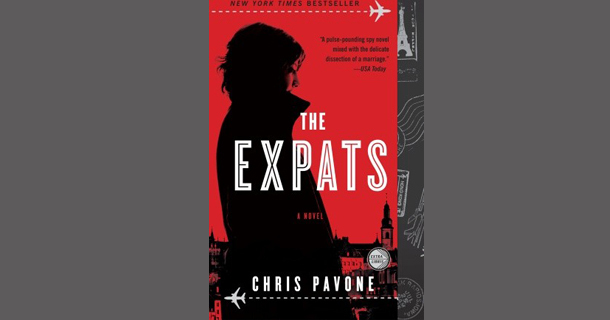 This post was inspired by the gripping mystery thriller novel The Expats by Chris Pavone. Kate Moore happily sheds her old life to become a stay-at-home mom when her husband takes a job in Europe. As she attempts to reinvent herself, she ends up chasing her evasive husband’s secrets. Join From Left to Write on Tuesday, January 22nd as we discuss The Expats. As a member, I received a copy of the book as inspiration for this post. Beautifully said. I’m finding that this business of finding happiness and balance (more like juggling?) is taking more patience than I imagined. And I’m glad you’re more at ease with your keyboard. That’s half the battle of writing! Thanks, Elizabeth. It’s nice to hear I’m not the only one out there feeling some of these things! Reading this inspires me to want to read the book — and check out From Left to Write — and reminds me I’m not alone. Other moms make it look easy, but we only see what happens on the public side of their lives. We don’t get to see all the messy, behind the scenes struggles. Unless they blog of course 🙂 Trust Providence (and I saw that to myself as much as to you). You’re exactly what and where you need to me at this very moment. You are always so wise, Aimee. I did really enjoy the book, but I found most of the SAHM misery to be a bit extreme. What I liked about it is that she lived her life through the lens of her career. I think most SAHMs are that way. I see my life through a writer’s lens. My teacher friends, see their lives through that. Etc. Etc. Enjoy! I understand that fear! I’m almost nine years into the stay at home thing and I still feel like I’m terrible at it! Add to that the fact that we are discussing homeschooling and I’m bound to feel like I really don’t know what I’m doing! I think stay-at-home moms often sell themselves short. I know I did at the time. But in retrospect, while I wasn’t good at playing Star Wars for hours, I was good at conversing with my boys. I think conversing wins every time! Keep up the good work—you may just have to discover what it is. What a lovely perspective. Thank you for sharing it. I, too, think I’m good at talking through things with my kids and reflecting on special moments. I’ll stick with that. As a work-from-home mom I feel your pain. Somehow I feel like working out of the house has made me a worse mom. Now, I am juggling a full time job, expectations of a stay at home mom (dinner anyone), soccer mom shuttling her 7 year old around, therapist for Sam’s many needs, wife, etc. I feel like I have now put so much on my plate working out of the house that only some of the jobs get done well… some of the time. My hat goes off to those mom’s that can do this- and mange to take care of themselves in the process! You’re doing a full-time job from home? My goodness, I can’t even imagine. But just the fact that you made that choice to be as involved in your kids’ many activities and needs says a whole lot to me about the kind of mom you are. The mom we all thought we’d be doesn’t really exist anywhere but in our heads, I’m sure. I have moments of being a great mom and moments of meh and I think the thinking about it and trying to have more of the good moments is where the victory happens. Great points, Kathyn. Thank you. I need to remember my drops of awesome! Amy, I can personally attest that you are an awesome mom, and your children are totally adorable:). When I stopped teaching, lots of people asked me if I missed it, and if I was dying to go back. 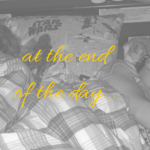 The truth was, once I started staying home with my kids, I finally felt like the “real me”. Being at home can be grueling and intense- nonstop work and it can be really hard being around demanding, needy kids all day. But my kids have taught me that they don’t need me to be perfect, they just need me. Even with all my flaws, I’m still “good enough” for my kids. And I’ve learned to try not to take myself so seriously and to be patient with myself. I’ve made lots of mistakes along the way, but I also have been given such a gift of time with my children. These are precious days and I’m determined to enjoy them. Thanks, Mary. Yes, you are certainly one of the few naturals that I continue to learn from. I, too, agree the days are precious and certainly feel lucky to spend so much time with my kids, but goodness, I look forward to the day I feel your confidence and patience. I don’t always feel like a great mom either. I don’t like playing Legos or pretend for hours. I thought once my youngest was old enough my two kids would play with each other more instead of with me. Instead they bicker and want to play with me all the time! Just like me, you’re probably being too hard on yourself. I believe that we cannot just be a mother. We need to retain a separate identity from motherhood or we’ll go crazy or lose who we are. 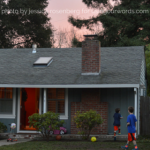 No doubt your kids will get to the point that they play together…mine finally do. It just happens to be that football is the thing they agree on, so dealing with injuries is my new form of busy. (That and protecting the baby who now things she can keep up with them.) It’s always something and day by day is a great way to live! Yes! Sometimes you say exactly what I’m thinking. Absolutely. You’re one of the people that I look to and think, in a couple years I’ll have it together like she does. So pat yourself on the back and hug those absolutely amazing kids you’re raising. Being a stay at home mom is truly the hardest job there is – and mostly because you have to check your ego at the door. There are no reviews (atta boy your awesome here is your promotion and raise), there are no projects closed and glory toasts, and there are certainly no free lunches. There are instead people judging you for your use of TV, non-organic foods and god forbid you used formula or let your child have a pacifier for too long(I did both!). It is somehow become a job that is marginilized (“Do you work or are you “just” a mom), and yet requires you to be everything to everyone while nothing is about you. There are no benchmarks to know if your doing it right save maybe the thank you your child proffers to an adult or an “I love you mommy.” But the fact is that your being home – your being there as the primary source of love, encouragement, icecream and even time-outs – its the greatest gift. You don’t need to worry if your doing it right (what is right anyway?) because your doing it and if you have made that very self-less choice – then your already the world’s greatest mom. This is not to say that women who choose (and I say choose because many have no choice) to work are not also great moms – everyone has to do what makes them happy because a happy mom is the best mom. But I can’t seem to find anyone that would say – a happy mom who is home at least part of the time – is, however messy the wrap job, a gift to your children. Beautifully said, Blake. I love the idea of messy wrapping…seems fitting for little kids anyway, right? Thanks so much for sharing your thoughts and experience! Amy – Bravo. On so many levels. And let me just tell you that I feel the exact same way. When I am at work and meeting with clients or I am with clients, I truly feel like myself. Like I have found what I am made for. I know I am really good at it. When I am at home and being a mom, I question myself endlessly. I beat myself up. I think it is the hardest job in the world. I have found for me that the right balance is working and coming home to spend time with my kids where I am happy and fulfilled and have more patience. But I feel guilty about that as well. All I know is that I am thankful for fellow mompreneurs like you to know that we are not alone. For me, I have to find the balance that is right for me. Having a business that gives me a flexible schedule but also fulfills me feels “right” for now. And knowing there is no “right” answer. Only what is “right” for ourselves. I admire you for so many reasons! Right back at you, Suzannah! Thank you! My blog began because of all those things. I wanted to be an awesome SAHM. Instead, I felt like a failure and isolated from the real world. Funny how when I got exactly what I wanted, it wasn’t what I really wanted. I do much better working outside the home. And I feel like a traitor for admitting it. I’m glad you have your passion in writing. We all need something that gives us a twinkle in our eyes and a spring in our steps. And I’m sure you’re a fabulous mom. You don’t need to be so hard on yourself! Thanks, Carrie. I’m glad you found your calling as well. No doubt a happy mom is a good mom! Thank you for sharing this! Every time my kid asks me to play cars with him, I feel a little guilty for wanting to say no… I thought I would be better at being home with the kids, but I found out that as much as I like to do crafts – I really do like to do them on my own for relaxation, not always to expand the kids’ minds. That’s because you take SAHM’ing to new levels of awesome. Seriously. You should be outrageously proud. Great points! I love that. I can definitely cuddle like no other. I guess that’s my mom thing.